Not sure when it was, exactly. Maybe when I got back into the car today to run an errand, wondered what the funny smell was, realized it was all my groceries, sitting in the car for how long? Maybe two hours? I'd carried the baby inside, asleep, and got busy doing other things. Excellent. Not many dairy products in those bags at all. Or, also yesterday, catching up with an old school friend and I realised I had not even looked in a mirror before leaving the house. I don't mean this figuratively in any way. And I'm not kidding. Didn't even look. I might have had fungus on an eyebrow for all I knew. Hear that rolling noise? ding-a-ding-a-ding-a-ding: that's a wheel rolling down my driveway. Is it when you open the door of the washing machine and almost trip over backwards. Stinkarooney, says Tilly. Well that's where all the damn school shirts are then. Is it forgetting to take the bin out, and getting that massive rush of dread, particularly when they're only collected fortnightly, can I make it? Rushing down the drive dragging a big green sulo with one arm, holding a baby with the other, trying not to tip it over on the cattle grid. Looking down in horror realising there's a good chance I might not even be dressed. Undies on. That'll do. I learnt today, as a lovely friend shared her story of discovering a liquified sushi roll in her handbag, that wheel-falling-off stories are better shared. Skidding on the recycling spilling out all over the kitchen floor isn't at all funny on my own. Sharing it with you is. ok – wheels falling off confessions from today – I was handed a note from school today that was due back on the 18th Feb (4 weeks ago), the chickens are unfed today, and there is a layer of sand sitting under the unpacked bags from the trip to the beach last week. And there is clothes behemoth mountain on the couch where small children will get swallowed and lost by the gang of unmatched socks. Hang in there – does it really matter? Love it! I left the groceries in the boot OVERNIGHT a couple of weeks ago. But hey, it’s Winter. We still ate that enormous turkey leg…amongst other things. The tone was set for the day as I careened down the drive way, when a quick glance in the rear view mirror highlighted purpose for the mad dash standing at front door, horrified! Note to self, when attempting timely school drop off try to have school kid in the car!!! “Mumma, why did you forget me”, “Darling I didnt forget you, the boys and I were just driving down to get the mail”. Truly, a little white lie is ok to prevent traumatising my new school boy, isn’t it???!!!!!! Love it, love it. My best was putting the veggies in the bin and taking the trash on holiday in the cooler box. I can certainly relate to clothes mountains, and the desperate search for a clean school uniform in the mornings. My most recent goof was making an awesome bread-and-butter pudding out of leftover donuts (from the Berry donut van – the best! ), and using salt instead of sugar. That first mouthful was a very unexpected experience – it was awful, but I couldn’t register for a moment what was happening! It really hurt to scrape it into the bin – it was bread-and-butter pudding, MADE OUT OF DONUTS! It should have been incredible :-(. At least I didn’t do the classic follow-up goof and feed it to the chickens. Someone else I know did that with a salty cake, and wiped out their whole flock. Salt kills chickens. so comforted to know I’m not the only one! No doubt it will get worse when there’s two little ones in my wake. Phew. Love this post. Goodness, the wheels fall off DAILY for me. Lately I seem to be on a losing streak – lost keys, lost sunglasses but worst of all, on Sat we lost our son. Yes, he just took off and, after almost calling the cops, we found him back at home, having ridden his little bike a couple of kms and over two busy roads (gulp). I also got in the shower one tired morning thinking ‘something’s not right’ … before I realised I’d got in wearing my glasses. Am also a good one for doing the absentminded stuff like putting veggie scraps in the freezer and frozen peas in the bin. Oh yeah, I know about wheels falling off. Hillarious! I regularly spray the deo in the hair, the hairspray under the armpits – must get ones that are not the same colour! I think I’m really chic, wearing my wedges on outings with the kids – have now had 2 marvellously scabbed over knees thanks to missing a step awkwardly. Such an attractive look for a 37 yr old! I have 4 kids, and regularly try to remember to not leave them behind or in the wrong place – the littlest is used to roaming KMART calling out for me …… *sigh*. Yep – a daily occurrence here! Wondering what is that smell? Oh – the potty hasn’t been emptied for a while…Yuck! Opening the washing machine to find a smelly load is so common here, then I wash it again, and sometimes even again when it gets forgotten for the second time. And, really, with 4 kiddos, washing a load three times isn’t smart, there’s always so much to do. Is one supposed to look in the mirror every day? Who has time for that? we call the stinkarooney washing pot plant clothes. Sometimes I feel organised enough to wash them again – other times, I just hope the sunshine will whisk away a bit of the pot plant odour. Mind you – when you iron them …. potty fresh! I’ve done that with the grociers – chicken breast in Brisbane during summer. Very very nasty. And it’s amazing how long I can tolerate the dog’s shredded leaves, sticks and general garden debris scattered from one end of the hallway to another. I think we must develop an amazing strength for this when we become mums 🙂 Breeds us endlessly tolerant! Love it!! Made me laugh – glad I’m not the only one. Currently covered in Avocado and strawberry juice, looking at the bench covered with dishes and wondering about the floor…. I totally love this post — and the comments are fantastic! Around here I sometimes wonder if we even have wheels to fall off! 🙂 So good to know that we all have those days that we can’t even believe! But the wise advice my mother has always given me: Have a hot cup of tea and go to bed, things will always look better in the morning! I like the way you think, Tess~ cute. Oh Renee. You know I’ve been thinking of giving up recently, I love inner pickle but sometimes I wonder why I write it. Maybe I’d be better off putting my energy into something else. And then I get a comment like this, and you’ll keep me going for another year. I love this space too, and I’m SO GLAD you actually look forward to it. Amazing. OK that is hilarious. You wally. ahhh, Berry donut van. AWESOME. Yep, that should’ve been a cracker of a pudding, how desperately disappointing! Good tip about the salt, I did not know that. Milk, no sugar, for me. Meet you at the coffee table. Truly, where would we be without tea? Lesser women, that’s what we’d be. Left just one bag of groceries in the car somehow. Yes, it was the bag with all the meat. Yes, it was summer. Yes, for 3 days I blamed my stinky boys. By then it was so very bad. Oh, oh dear! I looked down and had odd crocs on in the supermarket. Very stylish! Thanks for the chicken tip. I didn’t know I could oversalt them. Yesterday I took a photo of my massive pile of ready-to-be-folded laundry. It was covering an entire lounge, including cushions and at least 2 laundry baskets were barely visible amongst the clothes. So I will gladly join you, fellow traveller, in the barely-keeping-the-wheels-on sisterhood of mums with food stained clothes and love-full hearts. Who needs a tidy house anyway? I’d rather hug my kids than wash up ANY DAY!! Where did those wheels go? hahaha. This week I discovered a small mountain of unopened letters in the bottom of the pram from the past two months. Oops, did I do that? A cake baked with sugar, ummm no, that was salt. Leaving the house without locking the front door. Leaving the house without checking self in mirror, too often. 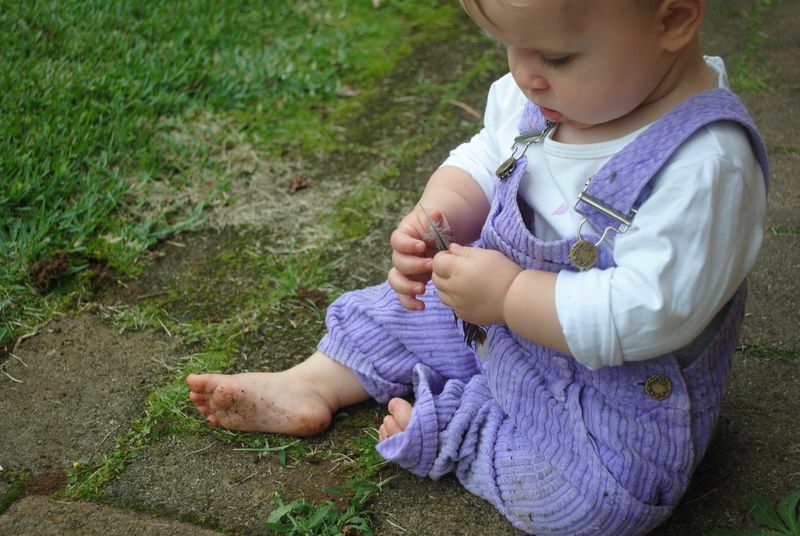 The old days: finding baby vomit in hair, in public. These days: finding flung baby mash in hair, eyebrows, anywhere infact. Leaving the house whilest wearing my slippers! PS. I did go back and change before actually reaching the main street. Just came across your blog via Soulemama and this post in particular struck a chord. I don’t even think of it as wheels coming off anymore – it’s just daily life. It would be very sad if you stopped blogging just when I’ve discovered you. And looks like lots of other people feel that way too. I would NEVER wander around the local village fair on a ‘relaxing’ Sunday, unable to walk a straight line because my period decided to come that day, and staying upright is an achievement to be proud of. Oh no, I schedule my period far better than that. In fact, I’m so organised, I’m not sure I even get periods these days..
And no, my son certainly did not vomit all over the kitchen floor at breakfast this morning. My lounge setting is perfectly intact, with no stains on it, if you heard about the mother with a a two seater lounge that has one cushion fine,and the other half eaten by silly puppies, you were wrong to think they were talking about me. That sort of stuff never happens here.